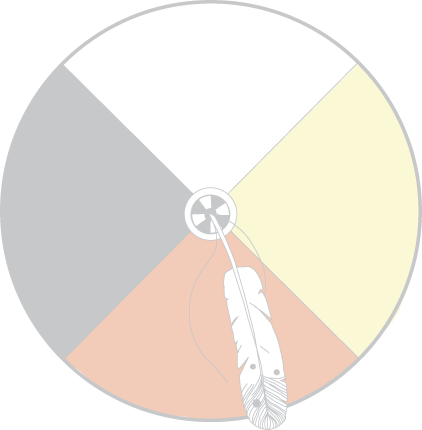 Kanawayhitowin uses the medicine wheel to help understand the issue of woman abuse in Indigenous communities and to support a holistic framework of healing to address this serious issue at a community level. The Eastern Direction offers the gift of vision. Having a strong vision is key, beginning with a basic awareness of the capacity of your community to address woman abuse. The Southern Direction helps us to understand abuse. Sharing information about why abuse happens, how it continues to happen and warning signs of abuse will empower every member with the knowledge needed to begin to make change. The Western Direction presents the gift of reason. By establishing connections with those affected by woman abuse we create opportunities to engage community and support a holistic model of healing. The Northern Direction calls for action. Your community’s commitment to end woman abuse will ensure change for self, families, communities and nations. By our actions and by remembering we move toward healing. You may need to journey around the wheel many times to build on the strengths offered in each direction. The more you journey around the wheel, the more your community will transform, allowing women in your community to regain their rightful place of respect as givers of life.